Gingrich/Baker Bill HB400 Opens Door for Federal $$$, Summer, and Part-Time Work Experience. HARRISBURG – The Pennsylvania House today took a major step forward to help young people with disabilities get the part-time and summer jobs they need to prepare for life when they finish school. The vote is a significant victory for the #IWantToWork campaign, an social media and advocacy effort led and managed by young people with disabilities. 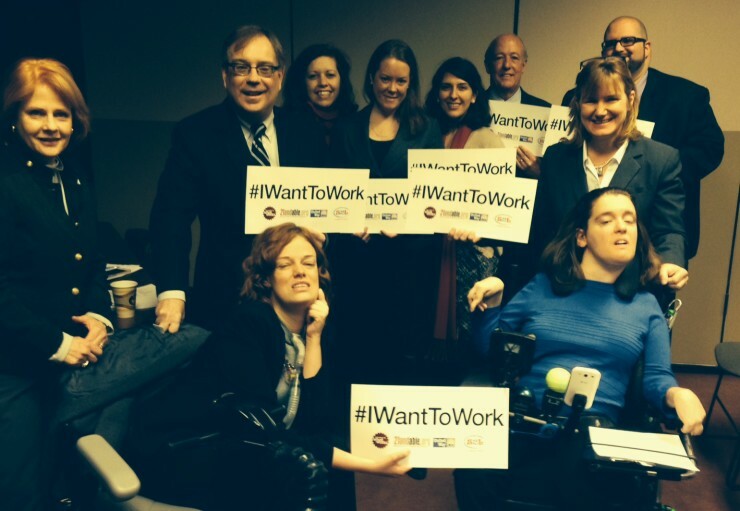 #IWantToWork is part of the Campaign for What Works. Today’s unanimous House vote approves legislation enabling the Office of Vocational Rehabilitation (OVR) to begin helping high school students with disabilities get summer and part-time jobs much earlier than it currently does. The legislation will set in place new processes and enable the Commonwealth to seek needed federal matching funds to support helping these students. “Most of these young people don’t get job counseling and placement assistance until their final months in high school. They aren’t ready to work, and a result, many do not go to work at all. This legislation will help move young people from their couches to work,” said Dr. Josie Badger, manager of the #IWantToWork campaign. “This will be a big change in Pennsylvania’s approach to helping young people prepare for work after high school,” said Robert Nelkin, president of the United Way of Allegheny County, one of the founding partners of the Campaign for What Works. “Young people with disabilities want to work. Employers know that young people with disabilities are loyal, dependable, and productive. This bill makes helping young people with disabilities get job experience a priority,” Nelkin said. Gingrich/Baker Bill HB400, was authored by Rep. Mauree Gingerich, R-Lebanon, chair of the House Labor and Industry Committee, and co-sponsored by dozens of members, including House Democratic L&I Chair Mark Gergely, D-Allegheny. Similar legislation, SB 200, authored by Sen. Lisa Baker, chair of the Senate Labor and Industry Committee, has been introduced in the Senate. The legislation has the support of major business and labor organizations across Pennsylvania. Gingrich/Baker Bill HB400 will enable the Commonwealth to acquire up to $18 million in federal matching funds for OVR. OVR will then be able help young people with disabilities obtain part-time and summer jobs earlier in high school. This will prepare them for work when they finish school. Right now, most of these young people will not get job counseling and placement assistance until their final months in high school, placing them at a significant disadvantage in the job marketplace. The #IWantToWork social media campaign has raised awareness of the need to help young people with disabilities through a selfie campaign on Facebook, Twitter and Instagram. More than 100 Pennsylvania legislators have had their selfies taken with the young people with disabilities around Pennsylvania. I think all of these videos are inbcedirly powerful. I recently attended a ceremony honoring the work of an organization that provides services for individuals with disabilities. A series of awards were given out to individuals with disabilities who had excelled in their places of employment. It was really nice to attend an evening dedicated to the accomplishments of individuals with disabilities, not only to honor their efforts, but to allow for discussion and awareness in the community. I think that many people don’t give very much thought to the difficulties facing individuals with disabilities as they search for jobs. It was nice to attend the ceremony I did, but it was only one evening of celebration, and the need for greater awareness in my own community is still very high. These videos, especially, Meet Sue do a great job of reminding viewers that we are all people, and we all deserve a fair chance to achieve our goals and support our families.